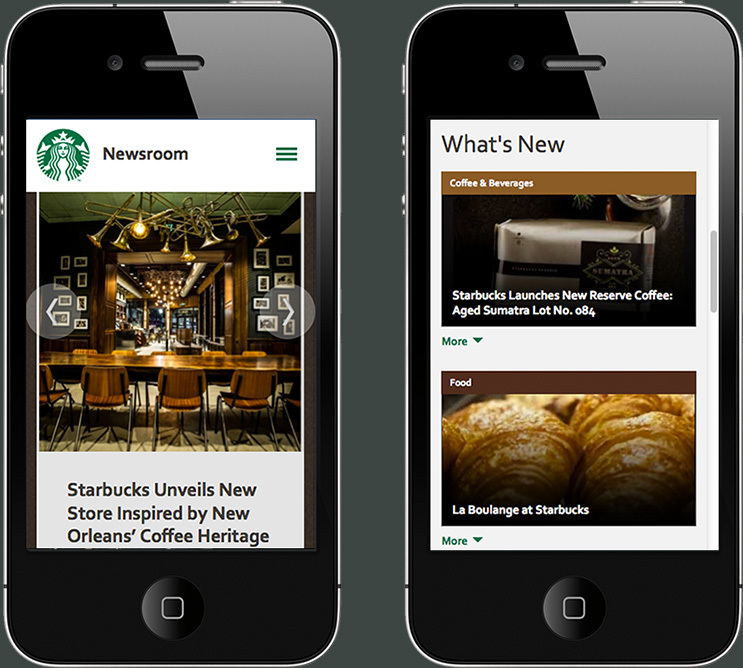 To meet the needs of an ever increasing number of mobile viewers, the Starbucks Newsroom transformed from a text-based, flat, web 1.0 experience, to an engaging, responsive mobile-friendly storytelling platform. 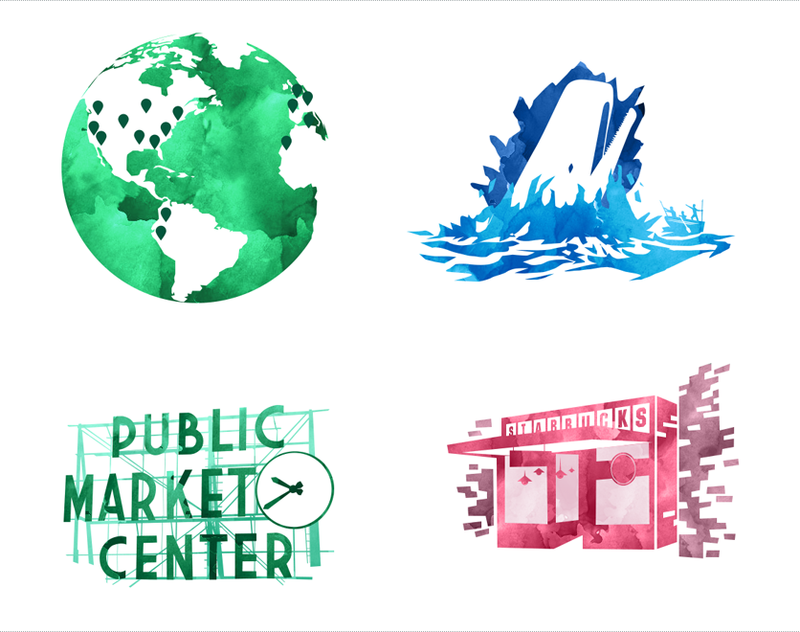 The newsroom would serve as a self-service tool making the most relevant information for media quickly identifiable in a visual format that inspired exploration and sharing. An audit of incoming media requests and the existing site’s traffic, time spent on site, and site exit points revealed the most relevant and in-demand content. Paired with ongoing media consultation capturing their perspectives on user experience and content structure, these insights directly impacted the site’s language, categorization and content grouping as well as newly added content filtering. Creating a site that allowed stories to be told, required transforming the text-heavy format into a modern, visually compelling design. The redesigned homepage visually highlighted key stories through the hero module and easily enabled media to see what’s new and important within sections that are aligned with a reporter’s beat as well as color-coded categories to differentiate between content. Today’s reporters aren’t tied to their desks, they’re on to the go and their reliance on their mobile device to do their job is paramount. The site redesign met the needs of the new content consumer through a visually rich, responsive site that’s as easy to use on a mobile device as it is on a desktop. 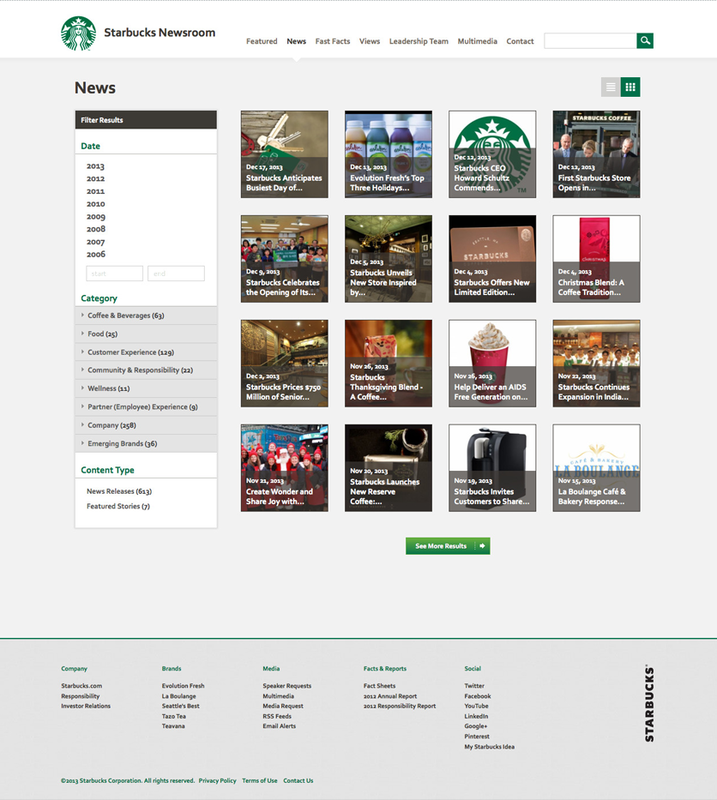 Since the launch of the redesigned Starbucks Newsroom in late September, the site has garnered 345K visits with 580K page views. This accounted for more than a 78% increase in visits and a 66% increase in page views from the month prior. 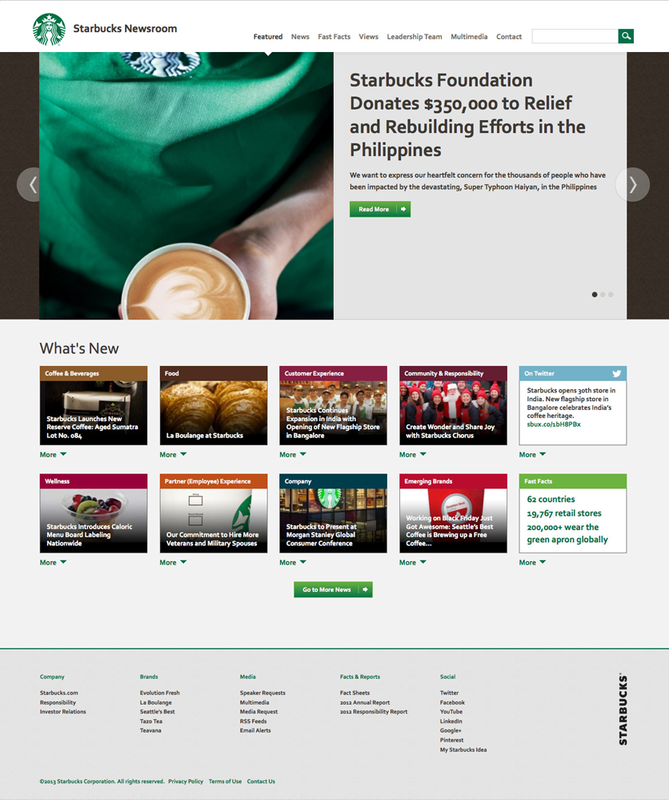 The redesigned newsroom has improved self-service in navigation and search functionality with categorization showcasing related materials and content topic filters. It has a responsive, visually impactful design featuring a hero module and enabled images and video embedding.